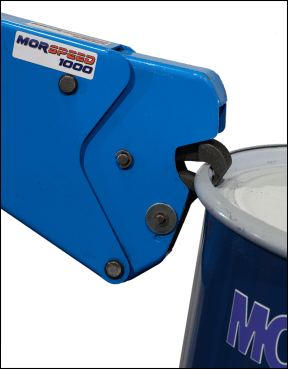 MORSPEED 1000TM forklift drum grabbers / movers are a safety conscious way to handle your drums. 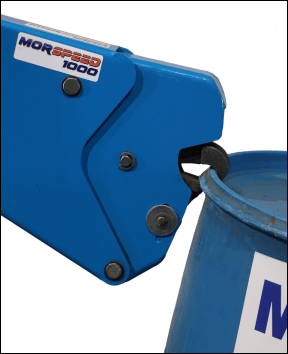 The MORSPEED 1000TM forklift attachment allows you to grab, lift, move and place a drum in minimum time without leaving your fork truck. Raise and lower the forks to grab and release the drum. The steel jaws are contoured to securely grasp the drum's upper rim. They are completely mechanical and automatic. They grip on the way up by engaging the lower jaw under the drum rim, and continuing to lift. 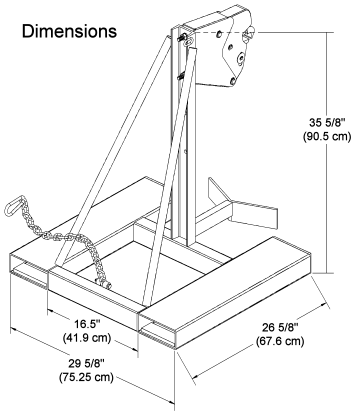 They release when weight is taken off the jaws by setting the drum on the floor, pallet, etc. The forklift operator just raises and lowers the forks, and drives forward and back as necessary. Requires 16.5" (41.9 cm) between forks, as fork pocket openings are 16.5" apart. Each fork pocket opening is 2.5" high by 6.5" wide (16.5 x 6.35 cm). Contact parts of the head and jaws that grip drum, and backrest, are made of spark resistant monel. Spark resistant parts reduce the possibility of mechanical sparks. They are not a substitute for grounding and bonding to prevent static discharge. 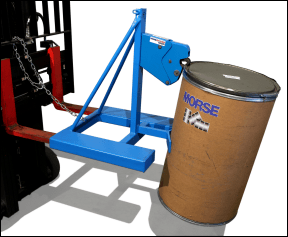 286-1 MORSPEED 1000TM Forklift Drum Handler 1000 Lb. (23 kg) L37" W33" H37"
(94 x 84 x 94 cm) 130 Lb. 286M-1 MORSPEED 1000TM Forklift Drum Handler with spark resistant parts 1000 Lb. MORSPEED 1000TM forklift attachment to lift, move, palletize and stack a drum with your fork truck. Drum grabber. 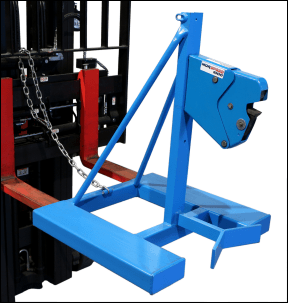 Forklift drum mover for your rimmed drums.